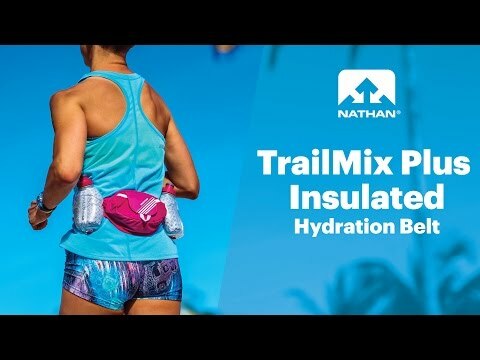 TrailMix Plus Insulated 2 Hydration Belt is rated 4.0 out of 5 by 9. Rated 2 out of 5 by Clcmb from Works While It lasts I bought this for marathon training. It works well, but lining started disintegrating after 1/2 dozen uses and bottle spouts started breaking when removed for cleaning. Biggest disappointment was contacting customer service and getting no reply multiple times. Rated 3 out of 5 by Dsc0001 from Nathan’s Trail Mix Plus Insulated PROS: Quality is good. Water easy to retrieve and put back. Pack is perfect size to hold everything I need for a long run CONS: Not sure how people keep this in place. It bounces and “loosens” from where I want it to be. The only way I can wear it to stop it from moving is to place it in the smallest part of my waist, which is below my rib cage and impacts breathing because I have to tighten it so much. If anyone knows the trick to keeping this in place, please let me know. I really want to love this hydration belt. Rated 4 out of 5 by FishBioGirl from Comfortable but how does the side elastic work? I really like the insulated bottles, caps are great, but I lost one, so need to find a replacement. But how do the elastic sides work to hold gels or shot blocks? Also would like to have bib attachment for races. Rated 2 out of 5 by lostmap from Worked well; was comfortable--until it didn't I have the TrailMix Plus Insulated Belt for about year-and-a-half. I was on mile 4 of a marathon when one of the holsters failed--the loop that connects the holster to the belt failed(completely frayed). Rated 5 out of 5 by Craig T. from Itâ€™s all in the adjustment When I first tried this belt I did not like it. I was wearing it too low. When I move the belt up around my waist, it did not bounce at all with full bottles. Highly recommend this belt. Rated 5 out of 5 by Christopher L. from Great Belt I purchased this for my first long run over 11 miles during June. The water stayed cool in the insulated flask with the heat and had enough room in the pockets for all my energy gels. Rated 5 out of 5 by Dawn B. from Hydration Belt I bought a new hydration belt to fit my iPhone 6s in the pocket. The belt was comfortable and snug so it didnâ€™t move during my morning run. Rated 5 out of 5 by Anonymous from Great belt Definitely would buy this again. If your considering this hydration belt I would recommend it without a doubt.